It’s not often you have a chance to meet a wine label designer, yet alone one from Edmonton. 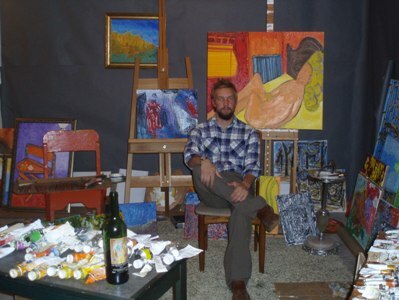 It is our great pleasure to welcome our friend and local artist Ramsey Dziubiak to deVines for an afternoon of Art and Wine this coming Saturday between noon and 4pm. Ramsey is a well-known artist whose works has been on prominent display at our store since its inception. Ramsey paints with brilliant coloured oils on fine Belgian linen and his pieces are unique in that they may be displayed in both traditional and modern décor – timeless motifs are carried throughout his works which has garnered international attention. The pieces reflect his life; the triumphs and failures, the excitement and ennui. Currently, his works hang in the houses of many private art collectors in Toronto, Vancouver and Edmonton.